Light Rail On Wilshire? Why, That Would Be Illegal! The recent selection of a route alignment for the Westside Subway Extension, as well as the release of the Wilshire Boulevard Bus Rapid Transit final environmental impact report started us thinking about something we read aways back regarding Wilshire Boulevard. “New subdivisions around the periphery of Los Angeles were not unusual in the mid-1890s, but the Wilshires had grander ambitions. Across the center of their land, they promised to grade a generous, one-hundred-twenty-foot-wide graveled boulevard. It would stretch just four blocks between the two parks, but the brothers believed that even a short stub of remarkable avenue would attract lot buyers. Forbid the laying of tracks? We had to determine if this had actually been codified, and turned to the City of Los Angeles Municipal Code to investigate. (a) No railroad or pipe line franchise shall ever be granted, and no railroad track or pipe line shall ever be laid or constructed, except water pipes, sewers, gas mains and conduits for telephone and electric wires, for service of the property fronting on said boulevards and house connections and connections of water, sewers, and gas pipe lines, or conduits for telephone and electric wires on intersecting streets. 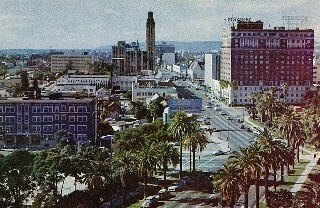 The early developers of Wilshire were successful in banishing rail lines from the Boulevard forever. Despite having the greatest urban rail system in the world in its heyday, no streetcars ever rumbled down Los Angeles’ grandest street. 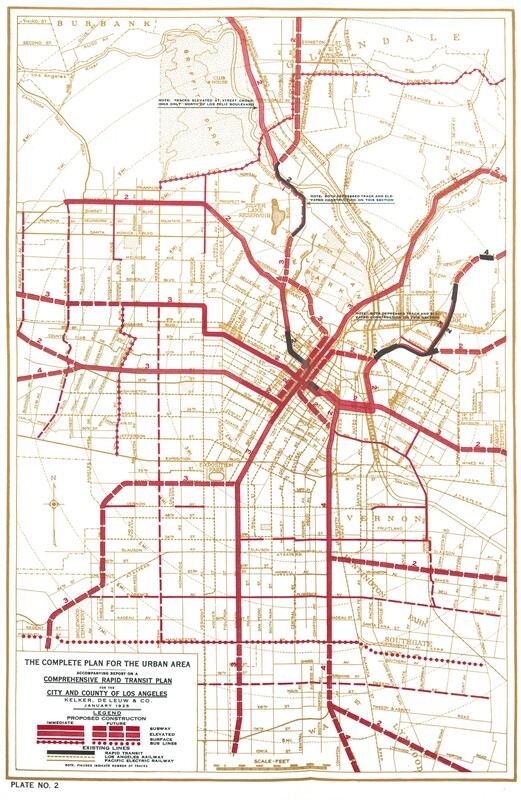 This 1925 Kelker DeLeuw City/County Comprehensive Rapid Transit Plan Urban Map shows nothing on Wilshire – cross-town streetcars were designated for Pico Boulevard, 3rd Street, and Hollywood Boulevard. 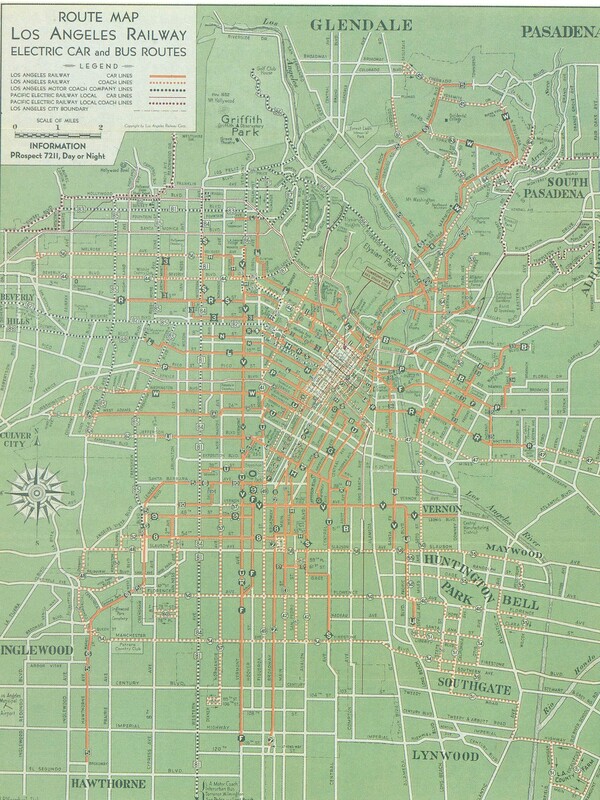 A 1938 Los Angeles Railway map depicts cross-town streetcars on several east-west lines: 3rd Street (R), 10th Street / Olympic Boulevard (L), Pico “Street” (P), Washington Boulevard (W), and Jefferson Boulevard (J). Only motor coaches served Wilshire Boulevard. 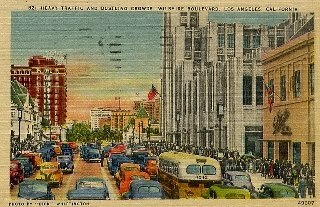 Wilshire still became the city’s grandest boulevard despite its lack of “rapid transit” – or perhaps because of it – and Rodericks’ book is a fascinating account of Los Angeles’ iconic boulevard and how one street can influence such a large city. We can’t know how the street or city would have developed had streetcars run along it, but Wilshire Boulevard never got stuck with overhead transit either. We might be thankful we didn’t end up with a Wilshire monorail, as one proposal depicted the intersection of Wilshire & Fairfax here. Meanwhile, this Saturday marks the annual Great Los Angeles Walk, which goes back to its roots this year. The day-long trek will take participants 15.6 miles along the entire length of Wilshire Boulevard, from Pershing Square downtown to its west end at the Pacific Ocean in Santa Monica. The L.A. Conservancy has a wonderful interactive website that helps visitors create their own customized tours of Wilshire Boulevard’s past and present. ← New & Notable: America’s Failing Infrastructure, "Climatopolis," & Why Do Shepherds Need A Bush?